How has cold/flu season affected your family??? For my family, this winter in our house has been TERRIBLE! My children seemed to catch something new each week and it has made it to be a LONNNGGG winter! I don't know what we would have done without Scotties tissues this winter! They have been by my children's side almost all day long as they constantly blow their runny noses, sneeze, or to wipe tears Let me be the first to tell you that having a reliable and soft facial tissue makes all the difference! We choose Scotties Facial Tissues because they are SO SOFT and gentle of my children's precious noses and they offer up to 20 percent more plush tissues per box. They also offer additional options including aloe-infused tissues for extra softness and soothing comfort. Also, check out this amazing story about the Scotties Tissues ‘Trees Rock!’ national video contest winner! Sarah Shreve, a girl in rural Texas who suffers from an anxiety disorder called “selective mutism”, has overcome her condition and won the contest! 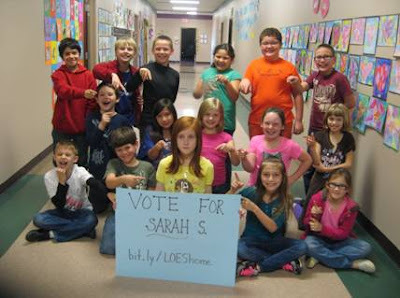 Third-grader Sarah Shreve’s teachers had never heard her speak – until two days ago, when the Lone Oak Elementary School student wrapped up the voting in a national video contest she had entered with a comment about her effort. Sarah suffers from a severe anxiety disorder called “selective mutism” but when she entered the Scotties Facial National “Trees Rock” Video Contest, things began to change, says her mom, Melissa. “This was a contest that Sarah felt passionate about. When we got the call this week about the judging, Sarah marched over to the phone and spoke into it, saying `We have an update for Team Sarah – WE WON!’” (One of the tools Sarah uses for therapy is a phone, which she speaks into without anyone on the other end.) But this call was different. Scotties was calling to tell her that, after a month of online voting and nearly 100,000 votes from the public, Sarah Shreve had won $10,000 for her school and $5000 for herself. And, there was more support -- everywhere. Sarah inspired a school employee to use their personal time to individually call people in the town and walk them through the voting process. Sarah even received letters supporting her –including a very touching one from a man who graduated from Lone Oak High School in 1954. At an assembly held in her honor – a very surprising thing happened – her efforts rendered others speechless, if not in tears! The prize money will be used to upgrade the technology at Lone Oak Elementary. A school with very few resources will now have the ability to provide students with laptops and tablets. During the video contest, students were encouraged to be as creative as possible in their entries – for example, by creating a poem, a play, a speech, a song, or a dance. After rigorous scrutiny by a panel of judges, entries from around the country were narrowed down to the 12 most compelling in the categories of clarity of message, relativity to the theme, and creativity. From there the contest went to a national vote. Scotties is deeply committed to being a sustainable company with their 3-to-1 promise. This means, that for every one tree they use, they plant three in its place. Over the last 50 years, J.D. Irving, Scotties’ parent company has planted 877 million trees in North America. Win It: Scotties is generously offering (1) Care Pack + $25 Walmart Gift Card to a lucky winner!